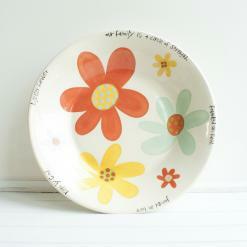 Handcrafted, large ceramic bowl with hand painted warm colored flowers and black wording around the edge of the bowl - Our family is a circle of strength - founded on faith - joined in love - kept by God - together forever. This bowl is approximately 14" in diameter. Our family gathering bowl celebrates the love of a family. This bowl is a unique wedding gift.